Delhi government has been in news since the day of its formation. In fact, some might say even before that. A general theme is also rising amidst all the decisions that are being made by the government. The theme is of reducing prices and making things affordable for the masses. Be it the decision to reduce the electricity tariffs or freeing the water up to 700 liters per day, the idea is the same. Going by this theme, government has decided to deploy free software over proprietary software. 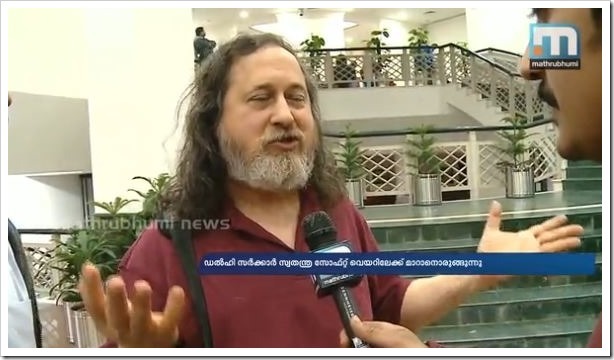 In fact, Delhi Chief minister Arvind Kejriwal has already met Richard Stallman and Joseph C Mathew, according to a television report. Richard Stallman is a software programmer who promotes of free software. He launched the GNU project and Free software foundation and basically if you are thinking free software, he is the guy to go to. Joseph C Mathew is the former IT advisor to Kerala government which adopted free software in all government establishments. This meeting indicates how serious Delhi government is regarding the matter. Initially, it is supposed to begin from the educational sector. In the first phase, all educational institutions will change from the proprietary software to free ones. This would be a huge setback to companies like Microsoft which earn a large amount from these deployments. Even companies like Google might not be well off despite having free Google Apps as the way of Stallman would lead to Linux and similar products. If the implementation is done on large scale it would have several interesting implications. For example, students who learn on free software like Linux or GNU will not have the need to adopt to the softwares like Adobe Photoshop or Windows. This will reduce the piracy to a large extent. People pirate software that they have been using in office as they are comfortable with it. This would change with free software. Another result will be the revenue affect that companies like Microsoft and Adobe might observe. Delhi, despite being small is more technologically advanced than other cities or states. I am sure that these companies must have stirred listening to this news. They must have already started planning their next move. It is of note that Delhi is not the first government to do that, as Kerala government has already adopted free software. Thus, there are no doubts and concerns as to whether business will be disrupted because of this move. Kerala has already done it smoothly so other governments can do it too. If this is successful in Delhi, it is very much possible that other state governments will also start thinking seriously on this!